Hello! Thank you for sponsoring the Avi Choice Awards! A: I’ve been in SL for 6-1/2 years now. I ran across SL by accident searching the internet one day and it looked like a place where I could meet people. I was, of course, correct as I have made many wonderful friends from all over the world! The diversity of activities really surprised me when I saw how SL was a true microcosm of the real world and beyond. A: I spent my early days in SL role playing in ancient Roman communities. I played a gladiator in several communities even co-owning a Roman sim for a while. It was great fun and the stories we created during that time are still fun to read today. I still fight as a gladiator in my spare time because the thrill of the challenge is so exhilarating. As for what I’ve learned, the biggest lesson is that you can depend on the kindness of strangers. SL can be a very daunting place at first and the people I met that helped me learn SL was truly heartwarming. A: The Grove Country Club Estates is a thirteen-sim community that consists primarily of residential areas as well as a retail sim. It was founded in 2010 by Umberto Giano. We offer people a high quality, unique experience in SL where home is not just pixels. It’s a rich community offering many activities that bring people together to form a true sense of friendship and a neighborhood that makes you feel like you belong to something. I have a full-time staff of six people that help tend to the needs of each resident making their experience everything they dreamed of. I also have other people that help with growing and developing the community keeping it alive and evolving. Were it not for these incredibly dedicated people The Grove Country Club Estates would not be what it is today and I am deeply indebted to them for their dedication and vision that makes The Grove what it is today. A: Second Life would not be what it is without the incredible, diverse talents that keep us clothed, entertained and experiencing SL in a real-life way. Recognizing these people is essential to promote and acknowledge their outstanding talent and keep SL going. Sponsoring this incredible event is an honor and one way of showing my deep appreciation for all the nominees do to bring SL to life! A: I live in the Chicago area and have spent many years restoring a historic home which has been recognized as one of the finest examples of its type within the community. It was one of the featured homes on a past historic home tour our town has during which time 1,500 people got to see what I have accomplished. Yes, I cleaned a lot for that event! I love sharing it with people as well as entertaining and cooking. Music is also a passion both in my real-life as well as my second life. I love stage shows as well as the symphony and most every kind of music experience. A: I encourage people to come and experience The Grove Country Club Estates. 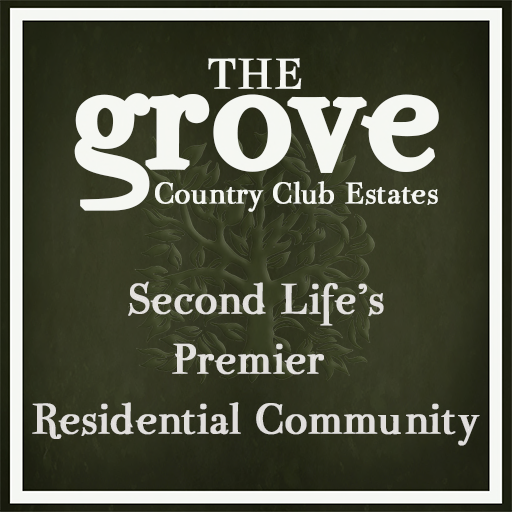 Whether you are looking for a place to live or just want to walk around and experience it’s beauty, The Grove is truly a unique Second Life destination.